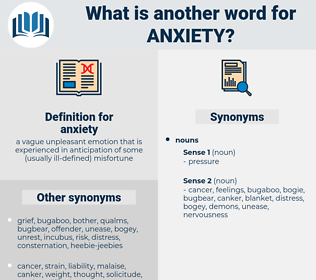 What is another word for anxiety? angst, uneasiness, disquiet, fear, nervousness. unrest, anticipation, alarm, discomfort, instability, eagerness, foreboding, dread, dismay, stress, stresses, tension, commotion, turbulence, malaise, disturbance, grief, expectation, turmoil, lust. anguish, apprehension, trepidation, unease, distress, preoccupation, restlessness, uncertainty, agony, agitation, frustration, excitement, pain, concern, desire. security, calmness, advantage, tranquility, confidence, peace, certainty, sureness, trust, joy, blessing, happiness, belief, assurance, faith, peacefulness, Collectedness, composure. fortitude, stoutness, valor, content, quiet, self-assurance, consolation, easiness, guts, comfort, unconcern, self-confidence, gallantry, relief, placidness, apathy, hardihood, satisfaction, bravery, courage, Doughtiness, carelessness, courageousness, solace, ease, intrepidity, audacity, calm, intrepidness, fearlessness, daring, nerve, dauntlessness, contentment, boldness, nonchalance. I wished especially to write to you to - day to tell you how we all think of you, and feel for and with you in all this difficulty and anxiety. And now he had no more cause for anxiety, but could buy bread for his wife and children with his gold, and wine into the bargain. anecdote, amnesty, anguidae, anhingidae, animist, amused, amazed, ansaid, angst, anisette, announced, amassed, animosity, aniseed, anguished, amastia, amino acid, awninged, amusd, Amish Sect, Anas Acuta, annunciate, anagasta. inquietude, trouble, restiveness, angst, uneasiness, fear, misgiving, disconcertment, qualm, disquietude, disconcertion, discomfiture, jitteriness, sinking feeling, scruple, anxiousness, nervousness, discomposure, insecurity, sinking, edginess, worry, concern, jumpiness, disquiet, care. hypochondria, castration anxiety, overanxiety, scare, panic, hypochondriasis. psychological state, mental condition, psychological condition, mental state.